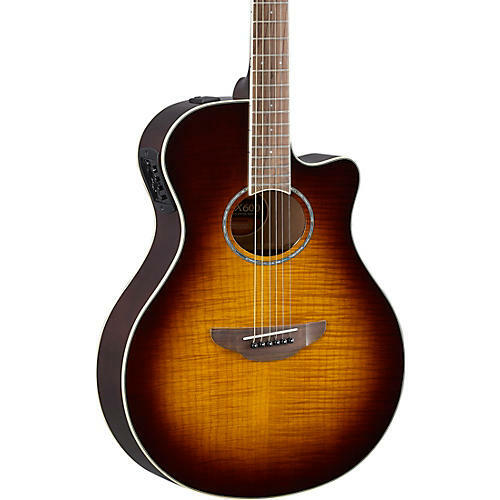 One of the world's best-selling acoustic-electric guitars, Yamaha's APX600 series now includes this APX600FM acoustic-electric guitar, an upgraded version with a flame maple top. Boasting a refined finish suitable for both electric and acoustic guitar players, APX’s thinline body combines incredible comfort, easy top-fret access and a natural acoustic tone perfectly suited for onstage use–with bright and clear mids, balanced highs and controlled lows. The APX600FM has dynamics, sensitivity and clarity built into the design, giving it excellent playability that is perfect for onstage performers.